Some efficiency enhancements when adding or cloning a template. A module for ProcessWire CMS/CMF. Adds some efficiency enhancements when adding or cloning templates via admin. Derive label from name when new template added: if you like to give each of your templates a label then this feature can save some time. The label can be added automatically when templates are added in admin, in admin/API, or not at all. There are options for underscore/hyphen replacement and capitalisation of the label. Edit template after add: when adding only a single template, the template is automatically opened for editing after it is added. Copy field contexts when cloning: this copies the field contexts (a.k.a. overrides such as column width, label and description) from the source template to the new template when using the "Duplicate/clone this template?" feature on the Advanced tab. 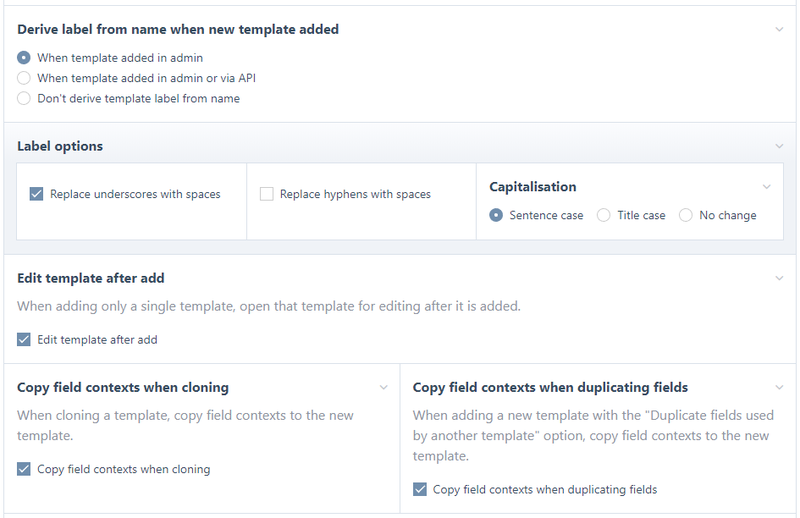 Copy field contexts when duplicating fields: this copies the field contexts if you select the "Duplicate fields used by another template" option when adding a new template. Install the Add Template Enhancements module. Configure the module settings according to what suits you.